Catalysis got its start in 2008. We are the first organization of our kind to exclusively focus on educational programs and resources designed to transform healthcare value. We are a mission driven, not for profit organization. It is our ultimate goal to transform the healthcare industry. We do this through careful research that includes listening to healthcare leaders and sharing best practices and innovative thinking that results in system change. Resources from Catalysis enable leaders to dramatically improve their healthcare systems, change organizational behaviors, and enhance the delivery of patient care while lowering its cost. 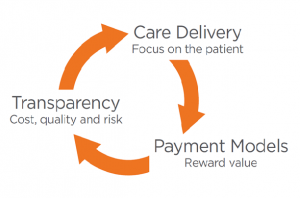 Our vision is to transform the healthcare industry to deliver higher value through experiments, collaboration and education that integrates the three interdependent components and spreads learning and accelerates improvement. Through its uniquely designed leadership education programs, Catalysis addresses today’s healthcare system shortcomings and inspires leaders to make sustainable change to transform healthcare value. Our Programs and resources move leaders and organizations through a learning spectrum – from awareness to the ability to teach others. No matter where a health system is on the continuum, a Catalysis program will help advance it toward transformative healthcare value.